-To delete the player you're currently searching (/s1 name) use /s1 without typing any name. There is no number of the search displayed so sometimes it might be problematic to remember which /s is the specific name. Little mod useful when someone is using trolls on your car. It protects from teleport and sets the hp to 100 repeatedly so you have time to troll him back. It's not effective against rapidfire/rpg. 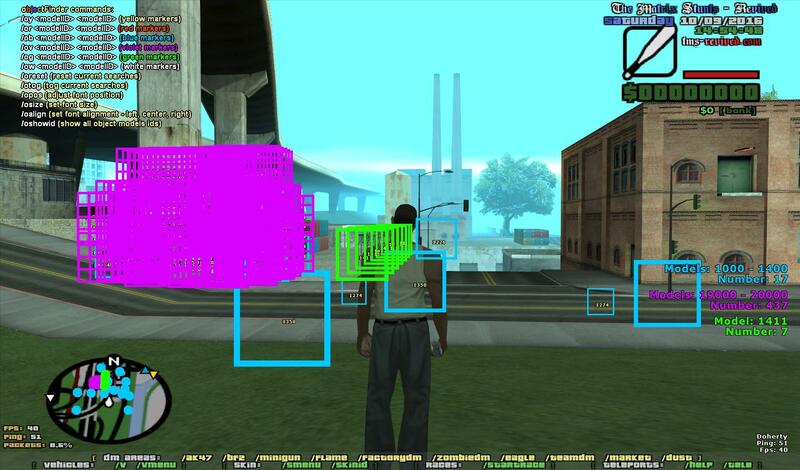 Each colour/search is limited to 1000 objects. Togging/resetting the searches may prevent potential crashes if they occur when you TP or enter interior. It's possible to search for range of object models as well as single ones. -To turn off the auto-music open the oSettings.ini and change "1" into "0"
Do we need something to be able to use this? Hmm, do you have Samp Functions 3.1.2? What commands are the ones causing crash? I have SF 4.0, MGF 4.3 and CLEO 4.1. The cmds dont work because the script is NOT loaded by CLEO, check the number of scripts that are loaded by pressing ESC; against the number of scripts you have put inside the CLEO folder. I have 9 CLEOs and only 8 of them are loaded, and this one was the 9th script. But it's ok I will try and no matter if I am ban or no, it looks amazing, thx !